Friday: All three players have cleared. Gryba and Ullstrom have both been assigned to the minor leagues, Binghamton and Tucson respectively. Thursday: According to Craig Morgan of The Athletic, the Arizona Coyotes have placed David Ullstrom on waivers, indicating that he is close to recovered from his most recent injury. Ullstrom was on season-opening injured reserve to this point, but will report to the Tucson Roadrunners if he clears waivers. Eric Gryba of the New Jersey Devils has also been placed on waivers according to Corey Masisak of The Athletic, and Brian Lashoff finds himself in the same situation according to CapFriendly. Cory Conacher meanwhile has cleared and will be assigned to the Syracuse Crunch of the AHL, while Phillip Di Giuseppe has cleared but will remain with the Carolina Hurricanes for now. Ullstrom, now 29, has been an enigma for his entire career. Selected 102nd overall in 2008, early on he looked like a steal for the New York Islanders given his size and speed while playing center on a regular basis. It’s hard to find quality centers that late in the draft, and when he made his North American debut in 2010 he found immediate success with the Bridgeport Sound Tigers of the AHL, scoring 41 points in 67 games. Unfortunately, that would be his career high at any level to this point. After two cups of coffee with the Islanders in which he rarely showed the kind of promise he had in the minor leagues, Ullstrom was off to the KHL where he’d bounce around to five different teams. He returned to Sweden in 2017 to play for his former club, HV71, but signed with the Coyotes this summer to give the NHL another crack. He hasn’t played this season due to injury, and now he’ll have to make his mark in the minor leagues once again. All the measurables are there with Ullstrom, but he’s never been able to put it all together for a prolonged period of time. Gryba on the other hand is a veteran defenseman just looking for a way back into the NHL. After not seeing the minor leagues for a few consecutive seasons, he found himself back in the AHL last year after being waived by the Edmonton Oilers. A buyout followed in the summer, and Gryba had to work to earn himself a contract this year with the Devils. Unfortunately, that hasn’t turned into any NHL action just yet. A trip to waivers might be the best thing for him, given the need for defensemen around the league, and his $700K cap hit may be attractive to some teams—even perhaps Edmonton, who has had trouble with the bottom of their group. There’s a real chance that Gryba is claimed, but if not he’ll have to face the minor leagues once again. Lashoff too is coming off season-opening injured reserve, and seems unlikely to be claimed at this point. The veteran defenseman has played just 17 NHL games since 2014, and is a full-time minor league player for the Detroit Red Wings. He’ll likely spend the entire season in the minor leagues unless the Red Wings are hit with more injuries to their defense, but even then the franchise would likely turn to younger more dynamic options. Thursday: Both Conacher and Di Giueseppe have cleared, but only the former will be sent down right away. The Hurricanes have decided to keep Di Giuseppe for now, likely because of their recent demotions of both Martin Necas and Haydn Fleury. Wednesday: Another day, another set of waivers for the NHL. The Tampa Bay Lightning and Carolina Hurricanes have placed Cory Conacher and Phillip Di Giuseppe on waivers respectively, after Jacob de La Rose was claimed by the Detroit Red Wings. Conacher and Di Giuseppe have both suited up already this season, but will likely be assigned to the minor leagues should they clear. Conacher, 28, has bounced around the league several times but keeps landing in the Tampa Bay organization. 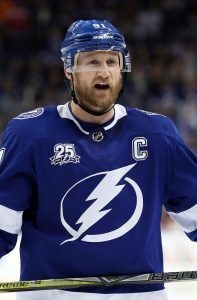 A veteran of 189 games split between the Lightning, Senators, Sabres and Islanders, he played in 36 last season with the Lightning and recorded 12 points. A proficient minor league scorer, capable of producing at nearly a point-per-game pace, he unfortunately hasn’t been able to find the same success at the NHL level. Still, for any team looking for an energy player for their bottom-six, you could do worse than adding Conacher on waivers. He’s on the final year of his current deal, which is currently two-way and pays him just $650K at the NHL level. Di Giuseppe is a different story entirely, given his status as a former top prospect. The 38th overall pick from the 2012 draft, Di Giuseppe has remained in the Carolina organization for several years but never found a ton of success at the NHL level. He did play in 49 games last season with the Hurricanes, but recorded just 13 games and couldn’t break into their top six despite some inconsistent performances from the players ahead of him. Still just 25, any claiming team would likely be doing so for his ability to play in various different spots than any hopes on him becoming a prolific scoring threat. In a very odd twist, the Tampa Bay Lightning have signed Cory Conacher to a one-year, one-way contract extension for 2019-20 worth $700K. The Lightning placed Conacher on waivers earlier today, and this actually may be their way of protecting him from being claimed by another team. Any team that wanted the veteran forward would need to take him with the extension in tow, something that may dissuade some from putting in a claim. Conacher was first given a chance by the Lightning after being overlooked in the draft and during a solid college career. After bouncing around in the minor leagues he earned an entry-level deal in 2012 and ended up scoring 24 points in 35 games for the Lightning before being part of the trade that brought Ben Bishop to Tampa Bay. After more stops in Ottawa, Buffalo, New York and Switzerland, Conacher found his way back to the Lightning organization in 2016. In 36 games last season he scored 12 points, and was a valuable call-up that could fit into several different roles. It’s hard to see a team claim him off waivers now that there is an extra year attached, though he still could provide some depth to various organizations around the league. If not, he’ll head to Syracuse where he will likely be the first call-up if Tampa Bay gets into injury trouble. After a impressive rookie campaign, the Lightning knew they had a special player in Point, who proceeded to have a breakout year as the team’s second-line center. Point, who is good enough to be a No. 1 center, provided the team with a 32-goal, 66-point season. Now in his third year, Point could really walk away with a huge payday if he can equal or even better on that performance this year. Cirelli looks to have the third-line center spot locked down after the 21-year-old had a successful, but short stint, last season. He posted five goals and 11 points in 18 games last season and played in all 17 games of the playoffs, adding a pair of goals. Sergachev has two years remaining on his contract and the 20-year-old defenseman had an up and down season, but still posted a nine-goal, 40-point season. He did have trouble getting regular minutes as the team often lost faith in his defensive play along with some immaturity issues. Regardless, the left-handed shot actually proved to head coach Jon Cooper that he can play on the right side, solving their depth issues on the right side. Sergachev should continue to develop his skills and also be in line for a big payday in two years. For a team known for its defensive depth on its defense, it’s a little shocking to see that they only have three players signed after the 2018-19 season. Almost all of the team’s defense become free agents, restricted or otherwise, including Stralman, Coburn, Girardi, Koekkoek and Dotchin. With the team heavily laden in long-term deals, the team might be willing to allow Stralman, Coburn and Girardi to walk at the end of the year. All three are solid players, but there might not be any cap room to extend any of them, especially if the team has to give long-term deals to both Sergachev and Point. Stralman’s situation will be the most interesting as he’s a solid defenseman that complements his partner quite well and was the veteran who mentored Sergachev last season. Coburn and Girardi are likely expendable. Koekkoek and Dotchin will only be restricted free agents, but neither got a lot of playing time with the team, especially after the team added defensive talent at the trade deadline. However, both could play bigger roles this year, or within two years. With the increase in salary being handed out to top goaltenders, the Lightning aren’t looking forward to Vasilevksiy’s contract negotations. Considered by many to be the top goaltender in the NHL at only 23 years old, Vasilevskiy will likely break the bank when the team signs him to a long-term deal. Montreal’s Carey Price ($10.5MM) and the eventual contract that Columbus’ Sergei Bobrovsky gets next year will likely just be the starting point for a goaltender who posted a .920 save percentage in 65 games last season. The team should be able to salvage part of that raise from the expiring contract of Callahan (assuming they don’t trade or buy him out before then). Callahan, will be eventually missed as he’s the heart and soul of the team, but injuries have negated his presence for much of the last two years. Once his $5.8MM contract expires, the team can apply that towards a new contract for Vasilevskiy (plus quite a bit more). Callahan, 33, provides a physical presence, but he only played 67 games and he had an injured shoulder for quite a bit of that time after missing most of the 2016-17 game. The team has locked up more players than most teams as they feel their core is ready to win for the next 10 years. The team started much of those signings back in 2016 when they were able to convince Stamkos to sign an eight-year, $68MM deal. 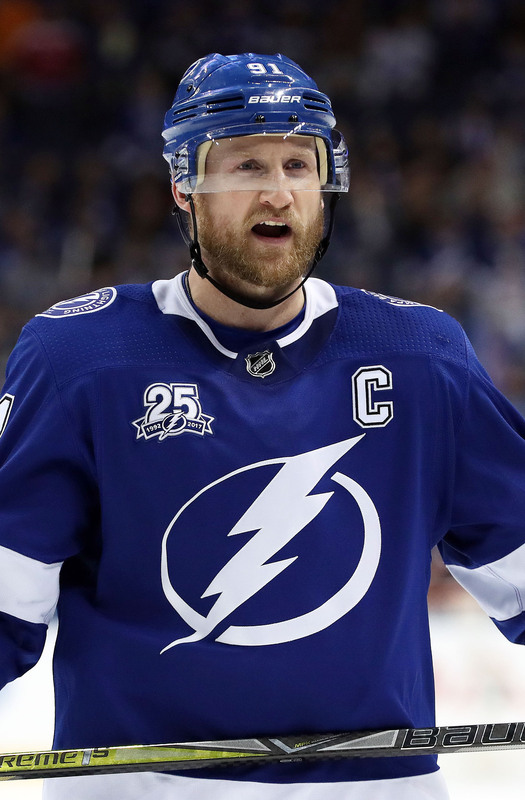 Stamkos, who then got hurt in his first season and only played 17 games, bounced back with a solid season last year, posting 27 goals and 86 points. The 28-year-old posted impressive point totals, but saw his goal output drop after tallying 36 goals in 2015-16 and 43 in 2014-15 (not to mention the 60 in 2011-12). However, with Kucherov on his wing, there may not be a requirement to score as much. Kucherov signed his eight-year, $76MM extension this offseason, as the team wanted to lock up their star winger, who many think is one of the top five players in the league. The 25-year-old posted a career-high in points, breaking 100 points this year. He also added 39 goals and now has scored 138 goals in the past four seasons. Once the team locked up Stamkos, they immediately followed that up with an extension for Hedman, who proved he was worthy of the eight-year, $63MM deal when he won the Norris Trophy last season with a 17-goal, 63-point performance. The addition of McDonagh at the trade deadline only made Hedman’s job easier as McDonagh was able to share some of those tough minutes and help prevent Hedman from playing too many minutes in each game. The team then followed up on that by signing McDonagh to a seven-year, $47.3MM extension that will keep the veteran with the team until he’s 37 years old. The team also locked up Palat and Johnson, two key wingers, to long-term extensions as well. The 27-year-old Palat has four years left on a five-year, $26.5MM deal. He was hampered by injuries last season, but still produced 11 goals and 35 points, but has the abilities to be a respectable 20-goals scorer year after year. The 28-year-old Johnson has six years remaining on his seven-year, $35MM contract and provided 21 goals and 50 points, providing solid top-six depth. The addition of Miller, who signed a five-year, $26.25MM deal this offseason, walked in and was an immediate fit on the team’s top line next to Stamkos and Kucherov. He combined for a career-high in goals and points as he gives the line much-needed size and style around the net. The only player who seems to not be an impact player would be Killorn. the 28-year-old power forward, who the team handed a seven-year, $31.2MM contract back in 2016. With five years remaining at $4.45MM, Killorn still provides offense, but in a bottom-six role. He scored 15 goals and had a career-high 47 points, but $4.45MM is a lot of money for a player in that role. The team has done an impressive job in building a franchise winner. They need only one thing — a Stanley Cup title — but the team has the pieces, most of which are just entering their prime, to accomplish just that. The franchise that general Steve Yzerman has things they have to deal with, but it seems to be in good hands. The team got a good deal out of Kucherov, who signed for slightly below-market value (thanks in part to Florida’s lack of state tax) and while they still have a few contracts they’ll have to deal with in the near future (Point, Sergachev, Gourde and Vasilevskiy), the team is set up perfectly to compete with the best teams in the leagues for the foreseeable future. They might even have the ability to take on another major contract like an Erik Karlsson if they wanted. The Vegas Golden Knights might have their hands full in their Western Conference Finals matchup with the Winnipeg Jets. The Golden Knights were rumored to have gotten involved in the Derick Brassard sweepstakes to assist the Pittsburgh Penguins in acquiring the veteran center instead of the rival Jets. However, Winnipeg countered by acquiring veteran Paul Stastny instead, a move that surprised many. That trade has paid dividends, according to NBC Sports Scott Billeck. The 32-year-old center, who will be a unrestricted free agent at the end of the season, is definitely increasing his stock with a solid playoff performance. While combining to put up a solid 16 goals and 37 assists this year between St. Louis and Winnipeg, he’s dominated in the playoffs with six goals and eight assists for 14 points in just 12 games. However, the bigger recipients of the deal might be his linemates, youngsters Patrik Laine and Nikolaj Ehlers, two of the team’s top prospects, who have really benefitted by his presence. Laine has 10 points in 12 games, while Ehlers has six assists this postseason serving on the team’s third line. Stastny, who is nicknamed Mr. Game 7 even before Thursday, continued to keep his nickname with three points in Thursday’s Game 7 when they eliminated the Nashville Predators. Now Vegas will have to face that player. Steve Carp of the Las Vegas Review-Journal reports that the Vegas Golden Knights will be without winger William Carrier in Game 1 today against the Winnipeg Jets with an undisclosed injury. While Carrier’s numbers are hardly impressive, the 23-year-old is a key piece to the team’s fourth-line “energy” line. While he travelled with the team to Winnipeg making him a possibility for Game 2, Carrier already had missed Game 6 of their matchup with the San Jose Sharks. While head coach Gerard Gallant didn’t disclose who would replace him, he did say he was impressed with the performance of the fourth line in Game 6 against the Sharks, suggesting that Ryan Reaves might play today in Carrier’s place. 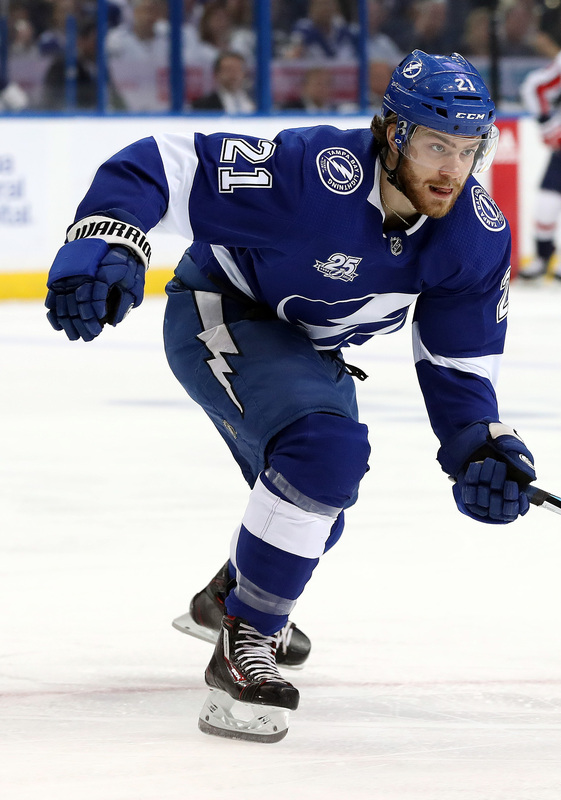 While Tampa Bay Lightning fans may have had a scare when defenseman Anton Stralman and winger Cedric Paquette both missed practice this morning (via NHL.com’s Dan Rosen), both are considered good to go for Game 2 against the Washington Capitals in the Eastern Conference Finals on Sunday, according to FoxSports Caley Chelios. Stralman missed the first 10 minutes of the third period with an undisclosed injury Friday. Jake Dotchin and Cory Conacher filled in for the two players in practice, but likely will not be needed Sunday. What are the Tampa Bay Lightning most thankful for? What a difference a year makes. One year ago, the Tampa Bay Lightning failed to reach the playoffs and now the Lightning (aside from perhaps the Vegas Golden Knights) are one of the most talked about teams in the NHL. Their 26-7-2 record is tops in the NHL and with 54 points, they are six points ahead of any other team in the league. The team is ranked first in goal scoring as they average 3.79 goals per game, .29 higher than any other team. The Lightning rank first in power play effeciency, scoring on 28.1 percent of opportunities. They rank fourth in the NHL in goals against, averaging a stingy 2.52 goals. They also rank third in goaltending save percentage at .921. What’s not to be thankful for? There are too many directions the team could go from the play of Nikita Kucherov and Steven Stamkos (ranked first and second in NHL scoring, respectively) to the impressive play of rookie Mikhail Sergachev, who the team acquired in the offseason. However, perhaps the most impressive is the performance of goaltender Andrei Vasilevskiy, the team’s goaltender who, at age 23, has changed his label from up-and-coming goaltender to NHL star. The netminder took over the full-time job last year after the Lightning traded away Ben Bishop. He posted a respectable 2.61 GAA in 50 games with a .917 save percentage in 2016-17. However, in 29 games this year, Vasilevskiy has posted a 2.13 GAA and a .932 save percentage. He has 23 wins this year in those 29 games. He had 23 wins all of last season. Throw in four shutouts and he has become one of the best goaltenders in the league. There isn’t a lot that Tampa Bay needs, but the team’s continued health and potential return of team veteran and leader Ryan Callahan might be nice. The team has had few major injuries to deal with this season after having several a year ago. Callahan, who crashed into the boards hard in a Dec. 14 game and suffered an upper-body injury, is expected to be out for at least a month and is a major injury to the team. While Callahan’s numbers aren’t that impressive (one goal, five assists in 29 games), Callahan is a key member of the team’s penalty killing unit (which gave up three power play goals to the Vegas Golden Knights earlier last week). The team would love to get Callahan back as soon as possible as his leadership abilities are also sorely missed. What should be on the Lightnings’ Holiday Wish List? Again, Tampa Bay doesn’t need much, but while the team has successfully integrated several young players into their everyday lineup from Sergachev, to Yanni Gourde to Jake Dotchin this year, can they continue that trend? General manager Steve Yzerman has already said that the team could easily make some upgrades and several of them will come from the AHL’s Syracuse Crunch, including Cory Conacher, Adam Erne, Anthony Cirelli and Alex Volkov, who are all thriving there. Conacher has taken Callahan’s spot and some of the others are likely call ups as the season continues. If the team can find a way to get production out of these youngsters, their depth might be the best in the league. On the surface, the loss of Ryan Callahan doesn’t seem too devastating. Afterall, the 32-year-old veteran has just one goal and five assists in 29 games. However, according to Tampa Bay Times’ Joe Smith, the loss is quite significant thanks to his ability to run a penalty kill unit as well as the leadership he provides on and off the ice. Smith announced yesterday that Callahan will be out indefinitely after crashing into the boards hard during Thursday’s game against Arizona. He will be evaluated in three to four weeks, which means the team could be without him for considerably more time than that. Callahan already missed all but 18 games last season with hip issues. Asked how the team will replace him, coach Jon Cooper wasn’t overly confident. The team will likely turn to J.T. Brown or Cory Conacher to fill that void, but the penalty kill could be affected. Conacher filled in for Callahan after he went down and Brown is expected to play in his stead today. One sidebar that Smith notes is that Conacher’s role might now have changed. Conacher, who cleared waivers at the start of the season, might not if he were waived a second time. The 28-year-old center has only played in seven games and was likely a candidate to send back to Syracuse soon. Once he hits 10 games, the team would be required to place him on waivers if they want to send him down to the AHL, so sending him down before he reaches 10 games would have been preferred. Now, with a Callahan’s injury, the team might be forced to keep him beyond the 10 games and risk losing him. Conacher has two goals and an assist in those seven games this season. Smith also writes that if the Callahan injury lasts longer than the three weeks, the team is more than capable of trading for a winger to replace him. However, according to Smith, that would be more likely in the case that Callahan is out much longer than anticipated. The calendar has turned to December, and the NHL is flush with trades and rumors. The Ducks and Devils completed a big swap, but there was also a minor trade between old foes and a waiver claim that brought a familiar face back home. Today is expected to be filled with more transactions, and we’ll keep track of the minor ones right here. As expected, the Buffalo Sabres have returned Linus Ullmark to the AHL after spending practice with the team yesterday. Robin Lehner was given a maintenance day, but the Sabres still wanted two goaltenders on the ice. Ullmark’s time will come with Buffalo, as he continues to impress in the minor leagues. Per the Pittsburgh Post-Gazette’s Jason Mackey, the Penguins have reassigned Josh Archibald to AHL Wilkes-Barre/Scranton on a conditioning assignment. The 25-year-old forward hasn’t been injured; he just hasn’t played this season. Through two months of the 2017-18 season already, Archibald has skated in only two games with Pittsburgh and had to this point avoided the AHL entirely. However, a total time of 21:38 of game action means Archibald needs to get his legs back under him in the minors if he is to be of any use in the NHL this year. The San Jose Sharks announced that they have returned goalie Antoine Bibeau to the AHL, as he’ll head back over to the Barracuda locker room. Bibeau, 23, was arguably the biggest off-season addition that San Jose made this summer, but is still looking for his first NHL action of the year. Bibeau has a very impressive 2.04 GAA and 0.925 save-percentage in the AHL this year, but with Martin Jones and Aaron Dell putting up those kinds of numbers themselves in the NHL, it doesn’t look promising for Bibeau to see extensive big league action this season. The Blue Jackets have recalled defenseman Gabriel Carlsson and forward Markus Hannikainen from Cleveland of the AHL, per a team release. Both players have spent the bulk of the season with Columbus but had each been sent down within the last week to pick up a bit of playing time at the minor league level to stay in game shape. With Oilers defenseman Adam Larsson heading to injured reserve, the team announced that they have promoted blueliner Ryan Stanton from AHL Bakersfield. The 28-year-old has a single assist in 11 minor league games this season but is no stranger to the NHL having 120 games of experience under his belt with Chicago, Vancouver, and Washington. The Lightning announced that they have brought back winger Cory Conacher from Syracuse of the AHL. The veteran has played just once with Tampa Bay this season (on Saturday against Pittsburgh) but he made the most of it, scoring in that game. As usual, he has been quite productive at the minor league level, collecting 15 points in 18 games.